Cormac Hollingsworth explains why, if you wanted to sell Northern Rock, you would have done it better than the Government. So why didn't they? So we’d like to show you the advice the government would have gotten. To show how homebuyers had been Glazered by the Northern Rock deal, we demonstrated on Thursday that the best outcome for homebuyers would have been remutualisation. Today, we’ll show you how an IPO – taking the Northern Rock onto the stock exchange – would have made the government an additional £440 million. An IPO requires that the bank is more valuable than equivalent banks on the stock exchange. George Osborne has pointed out that the ratio of the price of Northern Rock to the book value of what it can expect to be repaid from outstanding loans, exceeds the 50 per cent of the other major banks. While we dispute his number, we do need to explain why it is that, given that the other banks have a lower tier one ratio than Northern Rock – and are therefore safer, with a greater capacity to either make loans or asset strip – its price would not suddenly drop if it went on to the stock market. 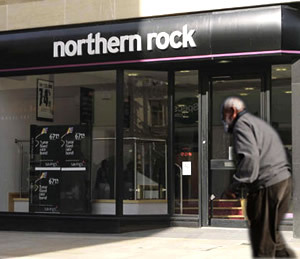 The government have pointed at the asset quality of Northern Rock as an explanation for the high book value. This is true, and that’s why the previous government set them up that way, but this is not why the other banks are trading at such a discount. We are back in a new banking crisis. The Bank of England said last week it’s as bad as the worst of the 2008 crisis right now. It is shareholders’ concerns about the ability of Barclays, Lloyds and RBS to refinance their huge wholesale borrowings that have prompted the discount. Between them these banks have £115 billion of maturing debt that they owe to others over the next two years. So what is the comparable position of Northern Rock? Again, by design by the previous government, Northern Rock has a lot more deposits than mortgages. In fact, at June 2011 it had £4.5 billion more deposits than mortgages. In proportion to its whole balance sheet, it had 22.5 per cent of its balance sheet as excess deposits. This is why we can be very confident of a great take-up from shareholders. In fact this is exactly why one of the investors in the Virgin consortium believes that they can IPO at double the valuation that Osborne was celebrating. We won’t be so bullish, but it has to be said that such a ‘liquid bank’ is very rare right now, so we believe that Northern Rock would receive a 110 per cent of book value. This is a conservative estimate compared to Wilbur Ross, who bought the bank along with the Virgin Consortium, who claims it could go on to the stock exchange for 150 per cent of book value. What remains to calculate is how much equity – what the bank owes subtracted from its assets, such as what loans it can expect to be repayed – the government can take out before the IPO. Given that the FSA has said that Northern Rock must have equity that at least amounts to 15 per cent of what it borrows – the so-called Tier 1 requirement – we have to assume that that’s the number until Northern Rock is listed, so that puts some limit on the amount of excess equity. But the government could hold onto Northern Rock a little longer, and take the excess equity off its balance sheet itself that the shareholders won’t use. As the balance sheet will look exactly like it would under Virgin, we’ve calculated that how much that would make the government below. However, because the government isn’t selling this excess equity at 66 pence on the pound it gets all the value. Add this together with the 110% of book value on the stock market valuation on the rump, that is proceeds to the government of £1.19 billion. And that’s how we lost more than £400 million. 11.5x book? Have you read the newspapers recently? No one sane will possibly pay that for a UK mortgage lender. Incidently, even 1.1x book is very ambitious. The way we lost the money is because we bailed out bondholders in full, the critical error is to believe that this has anything remotely to do with the current value. Based on the big assumption that Gordon Brown can share trade properly. Given he sold gold at a low – it snot looking good. So he then goes and pays over the odds for NR (not city of london based – Newcastle), and not a casino bank – a retail bank. Of course the current Tories can’t privatise competently. Just like their Labour and ‘Liberal’ ‘Democrat’ opponents, they have almost zero experience of running (or even working for) a business. How can any in the political class have any such experience when they have been in the public sector and/or party political bubble since leaving university? I’d love to see the CV of this author. Former bond trader with a PhD in whizzy economics. Is there anything left to say? But then, what would I know? I just advise FSA regulated bodies on occasion.